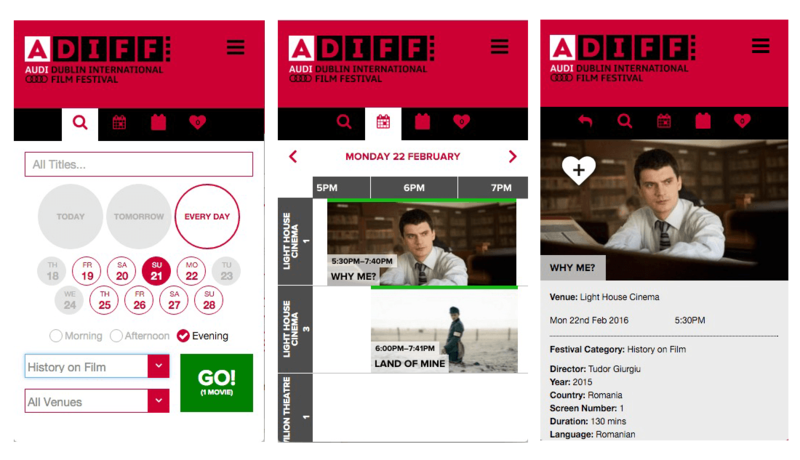 Portfolio of Bespoke Website Design and Web Development Projects - Responsive Mobile and Desktop Website with Ticketing for Jameson Dublin International Film Festival. 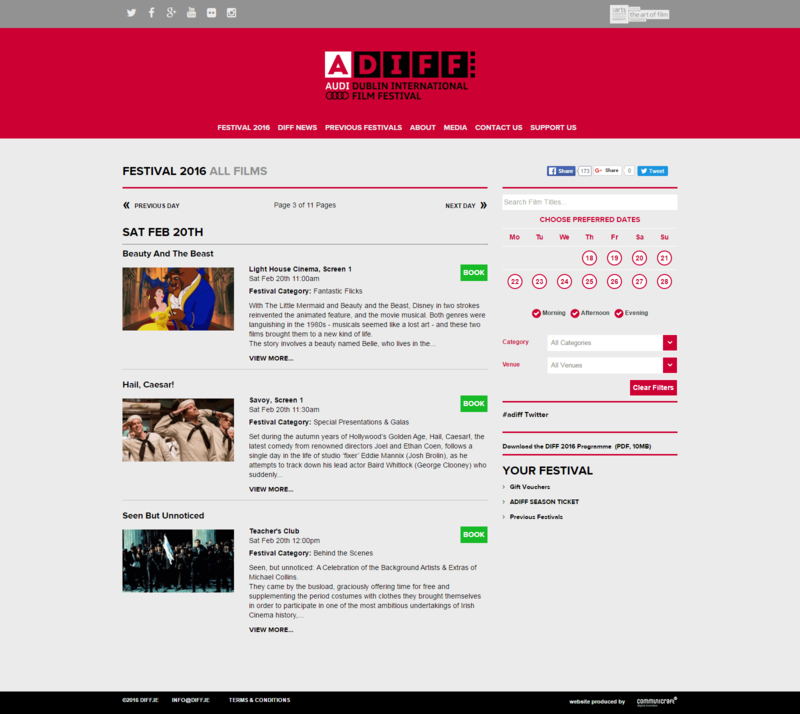 Communicraft produced and managed the bespoke website, content management system and integrated ticketing system for the Audi Dublin International Film Festival for a number of years. The site runs over three phases - pre festival, during festival and post festival, with high traffic peak times during release of schedule and launch of tickets, so it needs to be robust and stable to cope with traffic spikes. During the four years that Communicraft took on the production, support and maintenance of the site it was proven to be highly reliable & effective with corresponding increases in ticket sales. The same period saw online grow to account for more than 50% of ticket sales, and mobile, for which Communicraft created an intuitive "Adaptive" mobile web solution, now accounts for more than half of these. The mobile web application is an adaptive mobile design solution, tailored for a simple user experience for those out and about considering their next move for the evening or weekend - ideal for such a festival. The site is built using HTML5, CSS3 on the Expression Engine Content Management solution. Ticketing is provided by Ticketsolve. "The same period has seen online grow to account for more than 50% of ticket sales, and mobile, for which Communicraft created an intuitive "Adaptive" mobile web solution, now accounts for more than half of these..."
During the four years that Communicraft managed the production, support and maintenance of the site it was proven to be highly effective and robust with corresponding increases in ticket sales. The team at the Dublin International Film Festival rely heavily on our web team at Communicraft, as our audiences are increasingly mobile, using phones and tablets to access the festival programme and our video content.